This article was first published on The Malay Mail Online HERE. 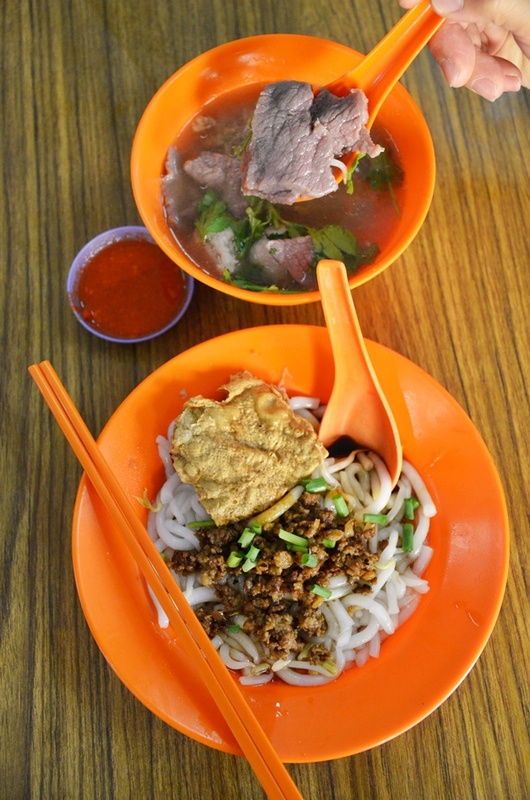 The Old Town is well known for its diverse range of hawker eats and fair share of vintage cafes; the latter which have gradually been injecting life back to the otherwise sleepy side of town past noon. The sudden rise of coffee culture in Ipoh, coupled with murals painted on walls within the Old Town enclave and the opening of the Sekeping Kong Heng retreat above the legendary kopitiam of the same name have drawn visitors from near and far. 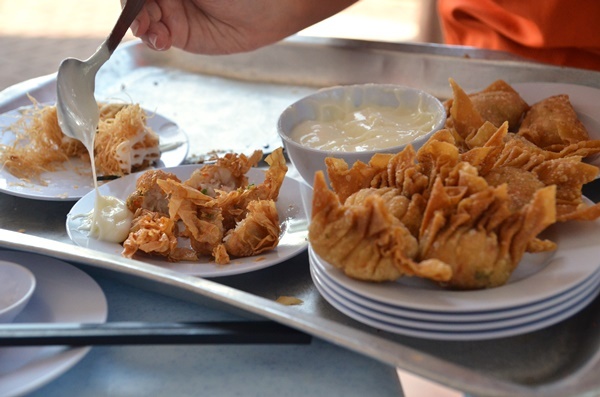 Talk about dim sum in this city well-loved by many as one of the food capitals in Malaysia, and most would point you to either Foh San, Ming Court or even Yoke Fook Moon; all three within a stone’s throw from one another. The hype surrounding the likes of Foh San has been circulating since decades back, when they served the early risers at their old outlet at the corner of Osborne Street. Those were the decent souls making a living working through the graveyard shift, or taxi drivers stationed nearby (and they still are) looking for a hearty start to fuel the day’s worth of labour. Now they have shifted to Leong Sin Nam road directly across Ming Court Dim Sum, which is also backed by a respectable number of years in business and personally, I think they serve higher quality dim sum compared to the new Foh San outlet. Many a time, the locals would shy away from the frenzied crowd at the dim sum giants, where the unreasonable congestion is caused by traffic, inconsiderate double-parkers and touts looking to earn a quick buck through “extortion” via the classic “jaga kereta” guys of Ipoh. It never fails to make me wonder when the local authorities will finally act on their “master plan” to capture these thugs smearing the good name of Ipoh. Read the original published article on The Malay Mail HERE. 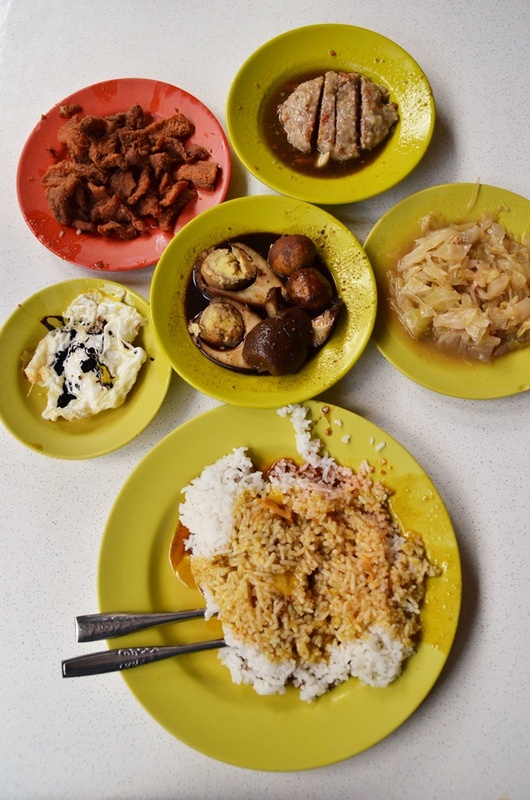 Wake up to the lingering aroma of Hainanese curry rice in Tiong Bahru – People DO eat these for breakfast! As much as I would like to move on and cover more ground with my Singapore food journey, I can’t help but share yet another Hainanese curry rice story with you. Blame it on the genes. 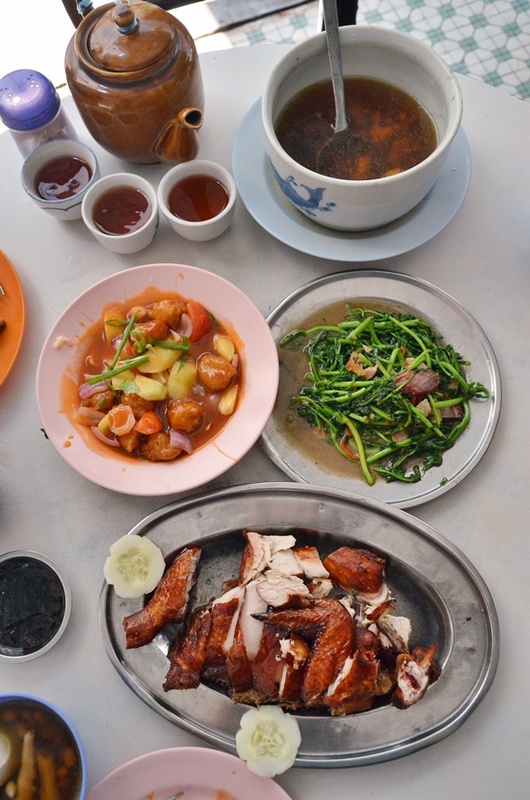 The Hainanese streak within me craved for another bite of succulent Hainanese chicken or pork chop, a glass of rich creamy milk tea, or even a plate heaped with plenty of steamed white rice smothered in a mess of curries and braised sauce. Following my recent excursion to Beo Crescent’s Hainanese curry rice, I discovered this stall hidden within another nameless coffee shop that lies in the Tiong Bahru neighbourhood. Here, it’s less than $5 (RM13) per person price tag was well justified by their crispy, thinly-sliced pork chops, soft stewed cabbage and braised eggs. I guess Tiong Bahru folks must have all the luck. This article was first published in The Malay Mail. Click HERE to read it. 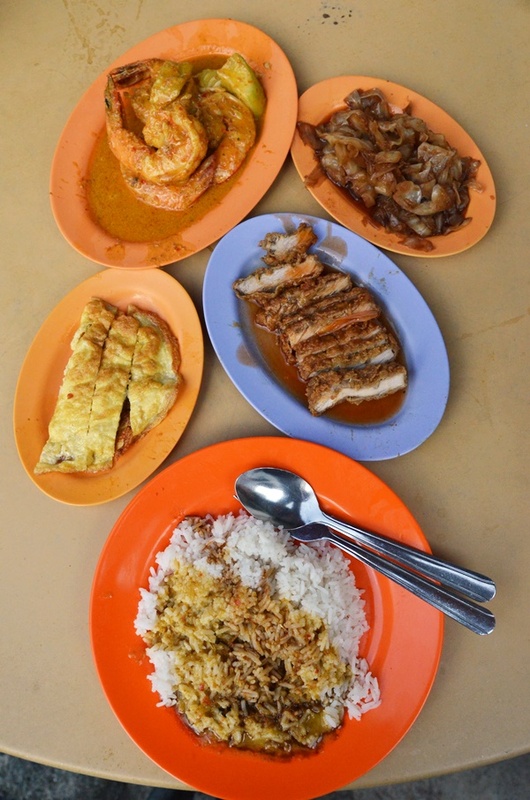 One of the most recognisable street food in Singapore that’s not easily found across the Straits in Malaysia is the Hainanese curry rice; something which I was not accustomed to back when I was growing up in Ipoh. I first had my taste of the rice with its ensemble of dishes about a decade ago around Port Klang, where the tradition still lives in renewed and reimagined ventures. What transpired from the Hainanese folks’ high learning agility and creativity in adopting various culinary influences, from the Western-inspired pork and chicken chops to meddling (albeit to some degree of considerable success) of the Peranakan curries, the Hainanese curry rice was believed to be a poor man’s fuel to stave off hunger pangs. 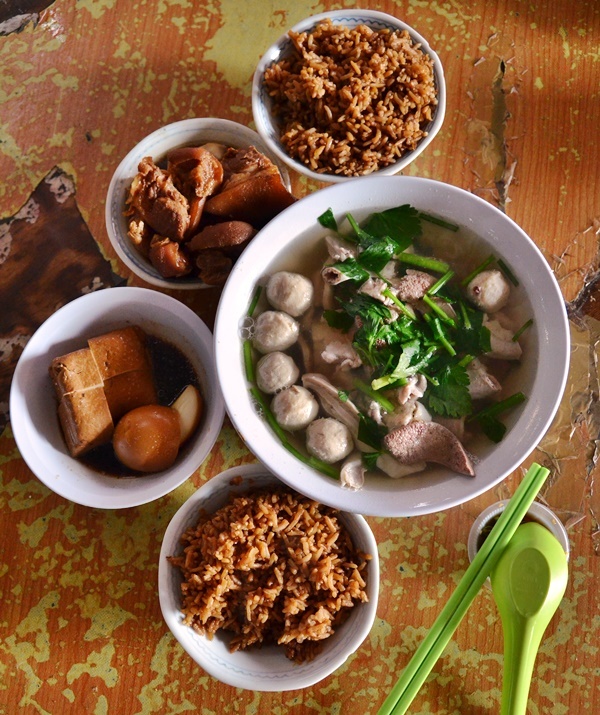 In the earlier days, Hainanese curry rice peddlers used to roam the streets of Singapore. Their dishes were somewhat imaginative yet limited; the selection largely limited to the ubiquitous batter-coated pork chops (authenticity matters here, some still use crumbled cream crackers, while most stick to bread crumbs), boiled to a softened pulp cabbage aka ‘chap chye’, fried egg with a dash of dark soy sauce, and a few curry dishes (remember the Peranakan or possibly Malay/Indian influences?). So where is the best chicken rice in Singapore? Do you recall — I am sure most foodies are still able to — the “battle” between Malaysia and Singapore a few years back over who “owns” certain hawker food? It sure placed hawker favourites like chicken rice, laksa and satay on the world food map, which probably was the only blessing in disguise resulting from this fiasco. But I shall not fan the flames here and let bygones be bygones. That being said, allow me to revisit some of the points of argument, in particular on Hainanese chicken rice which can be a relatively touchy subject since both countries have stuck their necks out by staking claims over the origin of this seemingly humble one-plate ensemble fit for any meal of the day. This article was originally published in The Malay Mail Online. Read it HERE. Right smack in the heart of commercialization, fairly strategic in terms of location yet somewhat removed from the cold, lifeless brick and mortar businesses and an extensive colony of residential homes, is this new village (kampong baru in Bahasa Malaysia) named Sungai Way in Selangor. When I first wandered around the neighbourhood, it surprised me that this area still exists within the realms of Petaling Jaya, wedged between areas marked for development. The atmosphere is entirely different from its more commercialized counterparts; relatively chaotic with narrow lanes suited for one-way traffic, single storey houses built almost within arm’s length of one another (a tad exaggerated, but you get the picture) and the multitude of foreign workers happily strolling across the labyrinths of Sungai Way all decked in generic uniforms past 5pm every day. This article was originally published on The Malay Mail Online. Read it HERE. The expected reaction when one talks about breakfast in Ipoh’s old town — the area recognised internationally thanks to the popularity of white coffee — is usually geared towards visions of sipping the aromatic brew over at Sin Yoon Loong or Nam Heong; both at loggerheads (from a purely business point of view, of course) over at one end of Jalan Bandar Timah. However, throughout the three years of working within the vicinity, I managed to uncover several places I went to again and again, some even on consecutive days or at least more than once a week. The first unassuming kopitiam is Sin Lean Lee Coffee Shop, located across the road from Kong Heng coffee shop which is the hallmark of a traditional kopitiam in Ipoh. First timers to the old town area are forgiven for choosing either the two white coffee specialists mentioned above, or Kong Heng/Thean Chun (also known as the Hall of Mirrors) next door for those are definitely Instragram-worthy places and one needs to tick certain boxes with first visits anyway. This is just as how one cannot miss bean sprouts chicken at Lou Wong or dim sum at Foh San, no matter how strongly the locals advocate against eating at these established outlets. 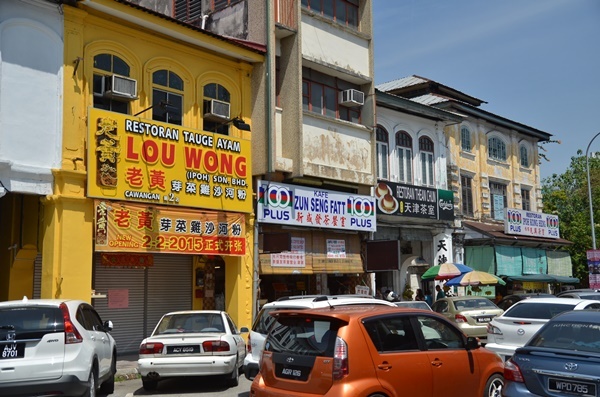 However, veteran foodies should know better and explore the possibilities of expanding their eating experiences in Ipoh old town.